Active Directory (AD) is a technology created by Microsoft to provide network services including LDAP directory services, Kerberos based authentication, DNS naming, secure access to resources, and more. Active Directory uses a single Jet database which a variety of services and applications can use to access and store a variety of information. Active Directory is used by system administrators to store information about users, assign security policies, and deploy software. AD is used in many different types and size of environments from the very small (a dozen users) to hundreds of thousands of users in a global environment. In this tutorial, you will learn the basic structure of Active Directory, gain an understanding of how Active Directory works, learn how to install Active Directory, and learn the components of AD. 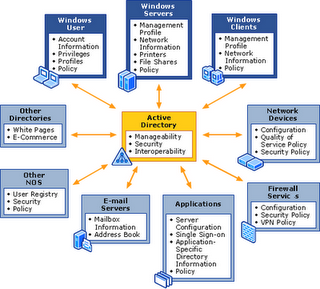 What is Active Directory: An overview of Active Directory and its use in technology environments. Active Directory Structure: Learn the basics of AD, its components (such as domains , domain controllers, trust relationships, forests, organizational units, etc), hierarchies within AD, and DNS. How to Install Active Directory: Active Directory installation is not complex in its process, but can be difficult in the future if you do not plan the installation correctly. Learn the tricks and tips you need to know to properly plan an AD installation and why administrators install AD the way they do. This free Active Directory tutorial is not a comprehensive one on the topic, but an introduction to Active Directory and its structure and use. Unlike Windows NT , Active Directory is designed for you to create a functional and usable hierarchy for your environment. Not only does this make the environment look cleaner, but it also allows central system administrators to delegate specific authority over areas to other administrators, team members, and groups. AD has a very flexible structure, allowing you to build a hierarchy in whatever way you wish – one big unit, broken down by geographic location, by department, by astronomical sign, or however you desire. At its core, Active Directory needs structure to work properly. It provides the basic building blocks for people to build their own directory. These basic building blocks of Active Directory include domains , domain controllers, trusts, forests, organizational units, groups, sites, replication, and the global catalog. AD uses DNS to name domains , computers, servers, and locate services.